Five years ago I knew absolutely nothing about the stock market. My degree from MIT is in Brain and Cognitive Sciences. I have had a lifelong fascination with the way our brains work: where our thoughts come from, why we feel certain emotions, and what makes us behave the way we do. My love for statistics and numbers sparked my curiosity about the stock market, and headlines about the market crash of 2008 finally lured me into the world of Wall Street. At the age of 24, while enrolled in graduate school full-time, I decided to learn about trading the stock market. Several months later, in December 2008, I bought my first stock on my laptop while sitting on the bed in my messy dorm room. In the five years that have followed, my stock portfolio has gained over 400%, producing an average annual return of 40%. These returns outpaced the S&P 500 by over 25% annually and, according to Barrons, yielded ten times the annual return of the average hedge fund during the same five-year period. The advantage I have discovered is that I can apply basic principles of psychology and simple common sense to understand how other traders think and successfully predict how they will behave. The stock market is complicated, but the behavior of other traders is not. 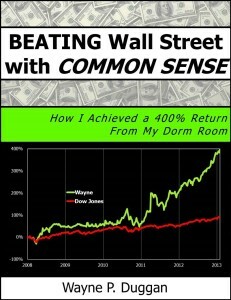 Beating Wall Street with Common Sense is the story of an inexperienced college student who learned to use common sense to profit off of the predictable behavior of other traders. The book provides encouragement and reassurance to anyone who is reluctant to take the first step in the stock market. I tell my unlikely personal story, including candid descriptions of my biggest successes and failures, and I explain how others can apply my 36 proven common sense rules to become the traders they always wanted to be.